A couple weeks ago I visited this lovely family farm in Grant Park, Illinois owned the Jones family. They relocated there last summer from their suburban home to raise their two young kids in a slower paced place where they could get more in touch with what was on their plate. They are growing veggies, raising animals and collecting eggs from the pens. They call their place Locavore Farm. I was there for a rehearsal of their dine-on-the-land dinners that will take place this summer, serving foods from their farm and other local ones. 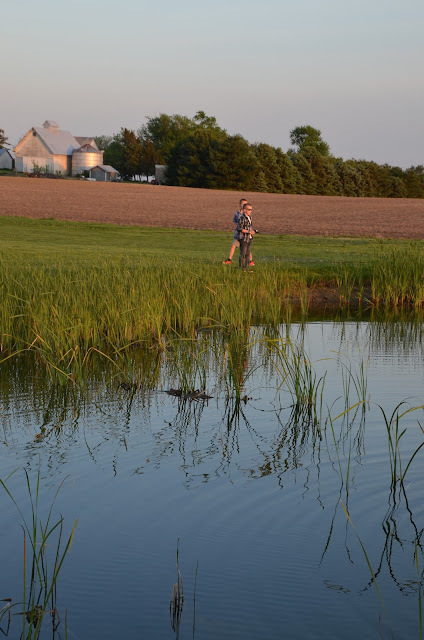 My youngest, age 10, came along with me and brought his fishing pole. It was such a peaceful evening and I can't wait to go back there. At the event, we had the chance to buy some farm fresh eggs and I couldn't resist. I used to purchase some from a farm in the next town, but they stopped selling eggs, so I've been back to getting them from the grocery store. If you've never had farm fresh eggs, you don't know what you are missing. There's such a distinct difference in taste and a hearty breakfast of farm fresh eggs is a great way to start the day. Hubby made us breakfast with those lovely brown eggs. He almost never makes eggs without the addition of some meat or cheese or veggies. He usually pokes around the fridge to see what kind of meat might be leftover from a previous meal. This time we had a bratwurst that was grilled the night before. I had visited Casey's Market in Naperville the day before and bought fresh bratwurst and we happened to have one left. 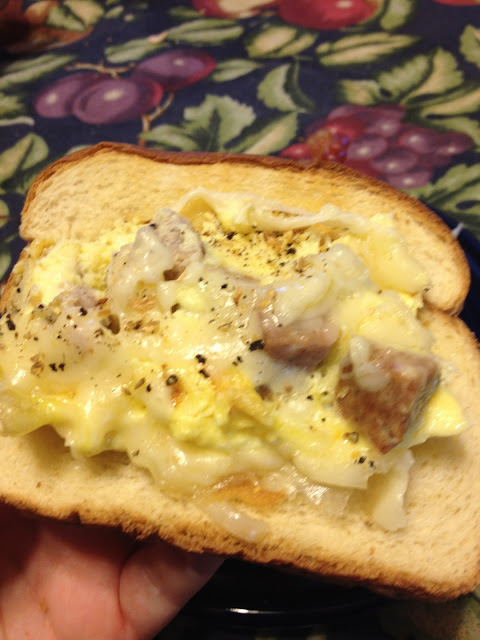 Hubby diced it up and added it to the eggs along with some mozzarella cheese and the results were quite tasty.